Ha! I took it and I'm Elinor Dashwood. It's interesting that you're Marianne! I've only seen the movies, but isn't she the young, impulsive, passionately loving one? Okay, I'm showing my lack of knowledge here. Can you tell me a little bit about Elinor Dashwood? 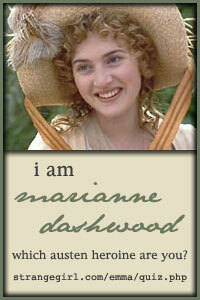 I came out as Marianne Dashwood, so I assume they're related. I've taken this test before, and each time I come up Elinor Dashwood. Makes sense. She's one of my alltime favorite Jane Austen characters. Elinor Dashwood is the older sister in Sense and Sensibility and Marianne is her younger sister. Elinor tends to be more level-headed and sensible while Marianne is more romantic and adventurous. They both have great personalities, but I wish I could be a little more like the outgoing Marianne. Thanks for enlightening me. I'm stunned - me adventurous??? Romantic - yeah, I can see that. I came out as Marianne Dashwood as well. We are romantic and adventurous at heart. That's why we write. In real life, I'm the level-headed, got to analyze everything type of person. So, what adventures have you been on lately? I haven't done much of anything the last few days except fight a sore throat and cold. Ugh. My Mom also has the bug. Oh, I know a couple of things I did although I don't know if they qualify as adventures. 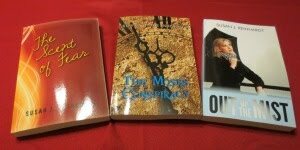 I spent the Amazon.com gift certificate I won over at Pixnpens on (what else) books. These tests are so much fun, but I don't know how accurate they are. Of course, I love the IQ tests that call me a "word warrior." LOL!